The fall days just make me think of hearty, wholesome meals and this lamb shank is the best way to celebrate staying indoors and getting cozy. The added bonus is that your house will smell dreamy while they slowly roast. Garnish: 1 minced garlic clove, 1 small diced chili, and a small handful of parsley, all chopped and mixed. Season lamb shanks with salt and pepper, then dust with flour. Heat oil in braising pan, large enough to hold all 4 shanks in one layer. Brown shanks all over, taking care not to overcrowd the pan. You may have to do this in stages. Remove shanks to keep warm while you reheat the pan, add a bit more oil and saute the onions, carrots & celery until they have softened. Deglaze the pan with red wine, stirring to get all the bits of goodness off the bottom. Add beef stock, garlic cloves, ancho chili (stem and seeds removed), rosemary, paprika and tomatoes. Stir well and nestle the lamb shanks back into the mixture. Cover tightly and put in the oven. Relax with that wine …… enjoy the aromas coming out of the kitchen …. This recipe is so forgiving – if you have more time roast at a lower temperature, if you are short, move the temperature up to 350 or 375 and shorten your cooking time. Check for doneness and as soon as cooked through remove the lamb shanks from the braising liquid and set aside. The lamb is cooked, but not yet falling off the bone tender, and that is what you are looking for. At this point, if you want a clear stock, strain the solids off. If you don’t mind a more rustic stock use your immersion blender or standard blender (if using a standard blender BE SURE to leave the lid off or some place for steam to escape … trust me on this). Nestle those lamb shanks back into the liquid and continue to roast until the meat literally falls off the bone. When ready to serve, sprinkle the garnish over top and prepare to enjoy the feast. I’m not sure what is going on with the weather, but we are having an unseasonal amount of rain and grey skies. 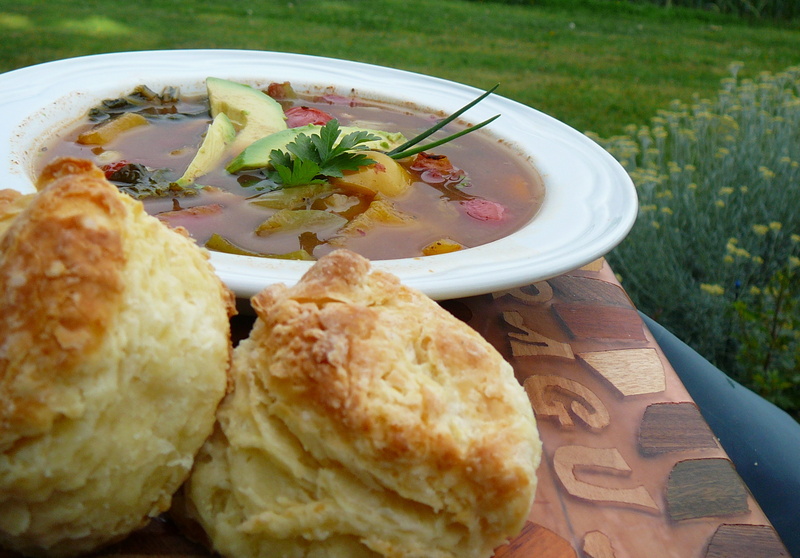 Today just felt like soup and biscuits. After a look into the freezer, I discovered some chicken stock, and chicken breast – perfect – I had lots of vegetables in the fridge so a hearty, warm soup was exactly what we needed. Throw it all into a pot – leaving the ancho and guajillo chiles whole, and allow it to simmer – taste and adjust for seasoning – add a little salt and pepper. If you like it spicy add more chile. To dress the soup up a bit, garnish with chives, avocado and fresh herbs. These ribs might take a little extra time but I guarantee that you won’t find tastier ribs anywhere – and they are certainly worth the effort. Make sure to serve with plenty of napkins and additional barbecue sauce for dipping. In small bowl combine dry ingredents. On large baking sheet place rub both sides of ribs with dry rub, pressing and patting it in. Cover with foil and refridgerate overnight. Preheat the oven to 250 – pour off any liquid on baking sheets, cover ribs tightly with foil and roast for 3 hours, until the meat is tender but not falling off the bone. Pour off any liquid on baking sheet. Melt butter, add onion, garlic and thyme. Cook over moderate heat until onion has softened. Add the rest of the ingredients and bring to boil. Stir well and continue to cook at a moderate heat until sauce has thickened. This does take some time, and will taste better if you allow it to slowly reduce. Taste and season with salt and pepper. Broil or grill ribs, continuing to brush barbecue sauce over. 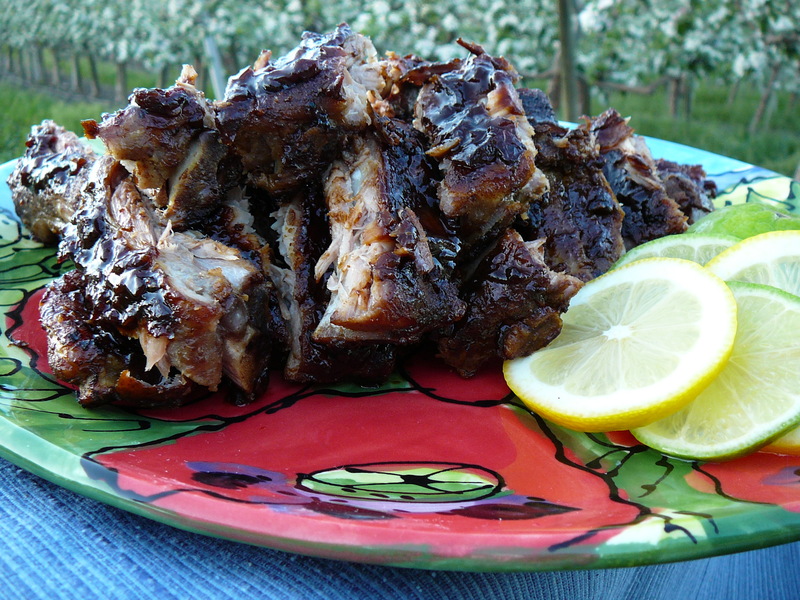 To serve, slice between each rib – mound on serving platter and scatter sliced green onions, lemon and lime wedges. If you love Mexican cuisine, as we do, then make a few substitutions/additions ….